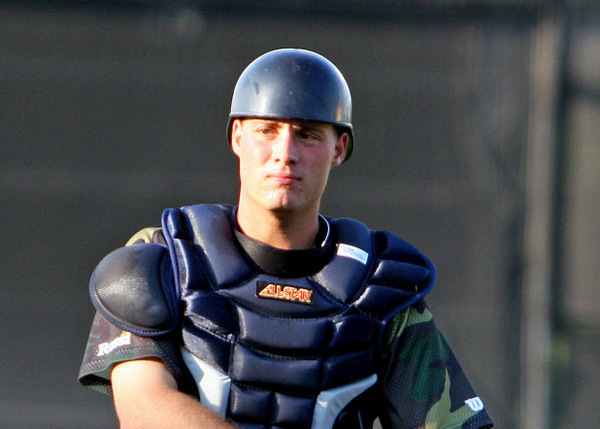 Catcher Jeff Kunkel with one of the Detroit Tigers’ minor league teams. Jeff Kunkel catching in the Yankee stadium bullpen. Every spring new players make their debut in baseball&apos;s major leagues. Some have gone through the ranks of the minor leagues to get there. But what happens when you&apos;ve toiled in the minors and you don’t get the call for the parent club-- or in baseball terms, “The Show”? Sounds like the plot from Bull Durham, but here, fiction mirrors real life. When players don’t get that call, many pack their bags and go home to assess their futures. Others hang on in the minors as long as they can and hope their dreams will still be realized. One young player from south suburban Chicago, Jeff Kunkel, had to make just such a decision about his baseball career path this spring. Kunkel was a standout Oak Forest, Ill. high school baseball player who went to the University of Michigan on a partial baseball scholarship. He had an outstanding college career as the team’s catcher, which included making the All-Big Ten first team. Major league teams drafted Kunkel and six of his teammates. (White Sox fans may remember two of them, Clayton Richard and Chris Getz.) The Detroit Tigers selected Jeff. But unlike the other drafted players, Kunkel decided to stay at Michigan for one more year, to get the chance to win the Big Ten title. He accomplished that dream. Only then did he start his journey in the Detroit organization. He was a catcher with terrific defensive skills and caught on every level for the Tigers minor leagues -- the various A-ball teams, Double A and Triple A -- but he never got past the top tier minor league team. At age 29, with seven years in the Detroit system, Kunkel was at this year’s spring training camp in Lakeland, Florida when he got a call to the office. The Tigers were not going to release him, but he was not going to be with the major league team as a player, either. Instead, the team offered Jeff an opportunity with the parent team as bullpen catcher. If he turned down the offer, he could remain in the Detroit Tigers minor league system. It wasn’t an easy decision, especially since he felt he could still play. But a player has to sense if, or when, it&apos;s time to move on and assess what opportunities are available. Kunkel decided to take the Tigers’ offer, saying, "it was a tough decision” to give up playing. “I have been coming to major league baseball games since I was a kid,” he said. “It was always my goal.” However, he added, he doesn’t view the change as disappointing. “I am in the major leagues doing something else,” he says. “It is a different opportunity and I am excited to see where it takes me.” After all his years in the minors, Kunkel is now a major leaguer-- not as a player but as a member of Tigers manager Jimmy Leyland’s coaching staff. His first road game was White Sox Opening Day at U.S. Cellular. Before the game he caught a bullpen session with Justin Verlander, last year’s American League Cy Young Award winner and MVP. Not a bad start for his new career. This new path, Kunkel says, "has presented a lot of opportunities for me to do a lot of things people don’t get to do a chance to be in the big leagues." Watching the likes of Verlander, Miguel Cabrera and Prince Fielder everyday "is going to be a great experience,” he said. At this point you might be asking yourself, how does Cheryl know this story (and maybe why does she care)? Jeff’s mother, Pam Kunkel, has been the head of the Chicago Bulls’ stats distribution crew for over 30 years. In that amount of time, you get to know people and their stories, and over the past three decades I’ve gotten to know Pam, Jeff and his twin sister, Heather. Every year, Pam and I talk about our children, and we’d talk about her son and his baseball career with fond interest. After Jeff made his big decision about his new job in baseball, his proud mom shared the news with me before a Bulls game. I asked her, what made her son special as a player and now bullpen catcher? She was a little choked up and said, “He has such a good work ethic—he’s so positive and he endears himself to people." She was as proud as a mother can be, as she saw her son throw batting practice in a Detroit Tigers major league uniform. So what’s down the road for this newly minted Tigers bullpen catcher? “Hopefully, it leads into other opportunities,” he says, like maybe a chance to coach or manage in the minor leagues. Sometimes a dream just takes a different path between baseball’s white lines.